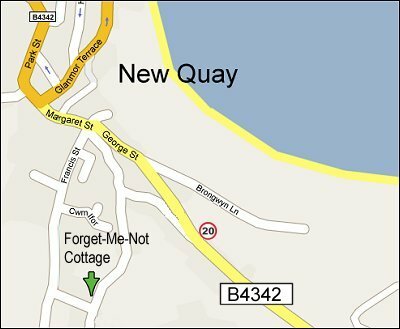 Forget-Me-Not Cottage, New Quay sleeps 4 / 5 with Wi-Fi + pets. 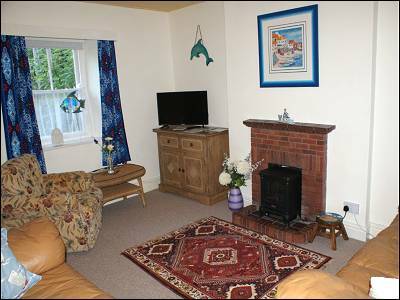 This 3 bedroom Fisherman's Cottage is in a peaceful location on a quiet lane, yet is only a five minute walk down the hill into the centre of New Quay with its picturesque Harbour and Beaches, pubs and restaurants. There is a distant sea view from the back garden. Across the road from the cottage are woodlands. Off-road private parking for one car is directly opposite the front door. Two well behaved dogs welcomed. 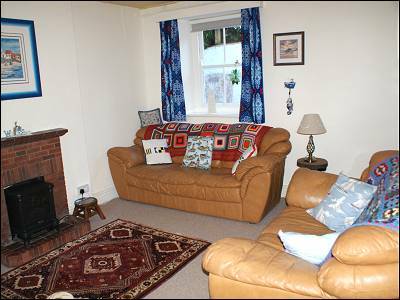 ACCOMMODATION - Relax in the sitting room on comfortable leather sofas where there is a 32" flat screen TV with DVD player. 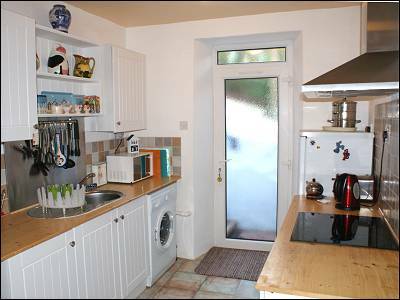 The kitchen / diner has a built in oven with ceramic touch control hob, microwave, family sized fridge-freezer, washing machine and all the usual small appliances and dining table seating 4 + window seat. Upstairs there are 3 bedrooms sleeping up to 5 people. 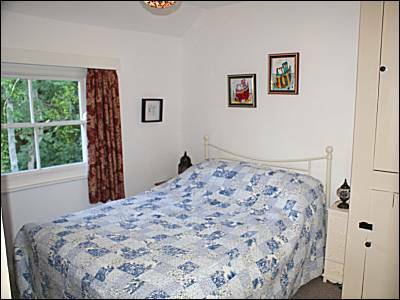 There is a double bedroom, a twin bedroom with 2 single beds and a third quiet reading room with a desk and bookshelves, and fold out foam chair / single bed . 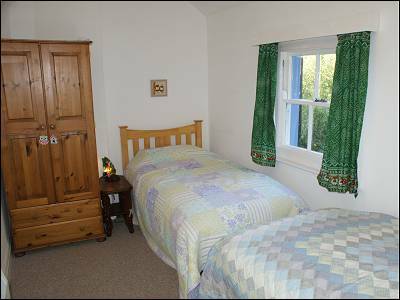 Bed linen, and towels are not provided, but all beds including the fold out bed have duvets and pillows. 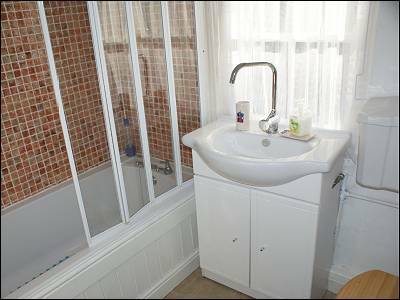 The bathroom has a full size bath with electric shower over, WC and washbasin plus a heated towel rail. Please note, we do ask our guests not to smoke inside the cottage. The house is heated by new electric radiators and storage heaters. For babies / toddlers - Folding Cot / Mattress + bumper set, baby bouncer. 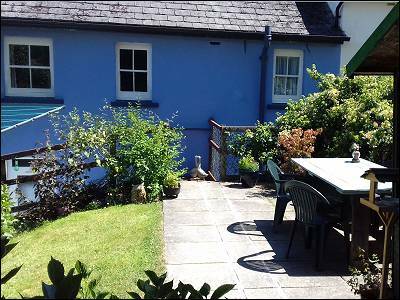 GROUNDS - There is a compact fully enclosed elevated private back garden. There are open tread timber steps from the back door leading up to the garden, which has a summer house and garden furniture. There is private off-road parking opposite the house for one car. ELECTRICITY - Electricity / heating is inclusive in the rental. 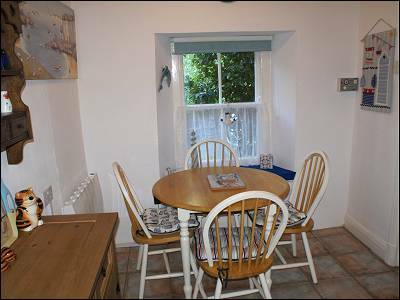 PETS - One or two well behaved dogs can be accommodated at Forget-Me-Not Cottage - for no extra charge. Dogs should be kept downstairs. ACCESS - Please note that the cottage is an older property with original doorways and stairs and an elevated garden area in the rear. There is level access from the parking space to the front door, with a step into the house. 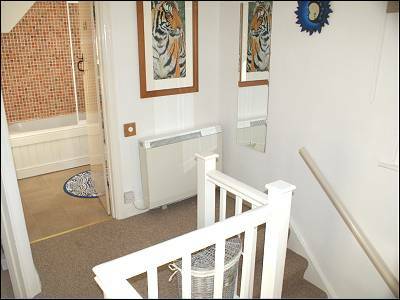 There are nine open tread wooden steps from the back door up to the back garden. There is a gate at the top. The steps may not be suitable for toddlers and small children and they should be supervised in this area. There are no downstairs bedrooms and the bath room is upstairs. The bath room is not specifically adapted for disabled use. 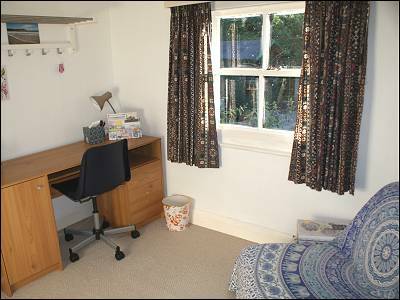 Weekly rentals Sunday to Sunday, short breaks available outside school holidays by arrangement, 3 night minimum. 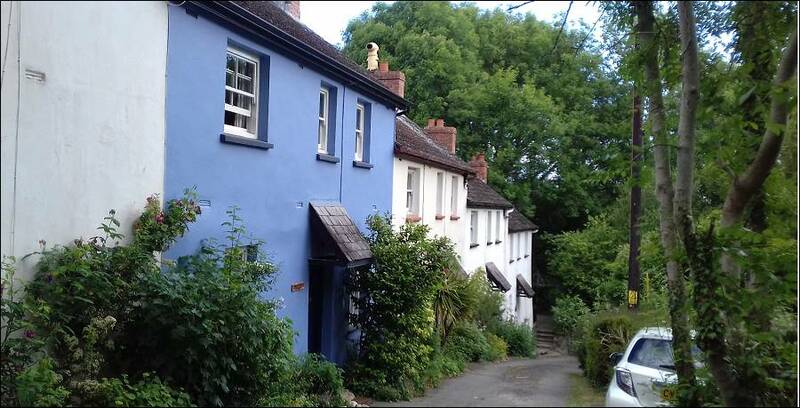 Nearby Aberaeron is a charming regency town and with its multi coloured houses and attractive harbour. 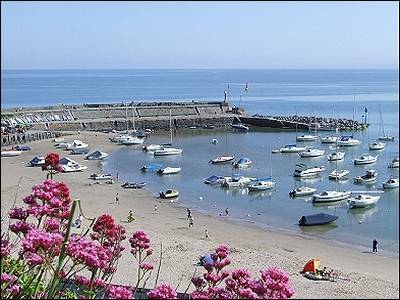 Twenty miles to the north of New Quay is Aberystwyth with its university, the Welsh National Library, an excellent museum and a wide range of shops. Here also you can take a trip on the picturesque Rheidol Valley steam railway to Devils Bridge in the nearby Cambrian Mountains. 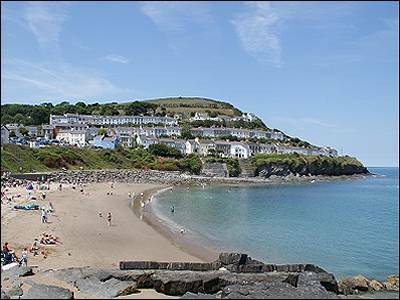 18 miles to the south of New Quay is Cardigan with its newly restored castle on the river Teifi and nearby St Dogmaels with its historic abbey and Poppit Sands. Just across the Teifi is the Welsh Wildlife Centre and a few miles up the river is Cilgerran with its spectacular castle.